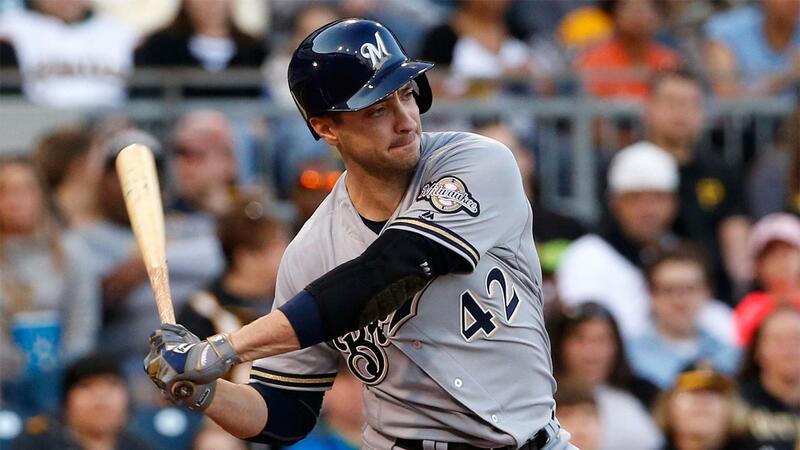 Ryan Braun delivered two key late-inning home runs to back up a quality start by Jimmy Nelson, leading the Brewers to an 8-4 win over the Pirates on Friday night at PNC Park. With Milwaukee up by three runs in the sixth inning, Braun seemingly put the game out of reach by crushing a two-run shot off the batter's eye against Pirates lefty Kyle Lobstein. But the Bucs rallied for four runs in the seventh inning, pulling within a run and preparing to send in their top relievers. Braun struck again in the eighth, though, crushing another two-run shot to center -- this one off Pirates setup man Neftali Feliz -- to give the Brewers a three-run lead. Nelson, who improved to 2-1 with a 2.79 ERA on the year, kept the Bucs at bay, as he threw six scoreless innings. But the Pirates finally got to the 26-year-old right-hander in the seventh, when Matt Joyce homered to center. Nelson went 4-2 with a 2.48 ERA in six starts against Pittsburgh last year. Brawny Braun: Braun gave the Brewers a 5-0 lead in the sixth inning with a two-run blast off the batter's eye in center field that traveled 437 feet, according to Statcast™. It was the second home run of the season for Braun, who added an eighth-inning blast to make Friday his 23rd career multi-homer game. Walk this way: Pirates left-hander Jeff Locke tied a career high with seven walks, one of them intentional and four of them to each of the Brewers' first four leadoff hitters. Three of those free passes came back to hurt Locke, coming around to score after beginning the inning on base. The left-hander gave up a run in the second inning without the Brewers hitting a ball out of the infield -- leadoff walk, infield single, catcher's interference, run-scoring double play -- and another in the fourth on a walk, sacrifice bunt, wild pitch and a single byDomingo Santana.